Can emotions be positively managed with food? In this episode of Emotions in Harmony, we have touched on a very controversial but at the same time very interesting topic. It’s about how you can see from the psychological point of view, everything related to emotional eating. 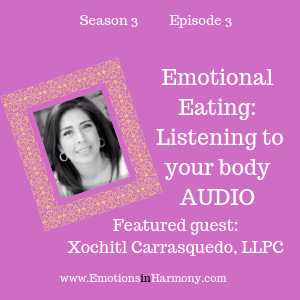 For this episode, Dr. Carmen Román, interviews Xochitl Carrasquedo, LLPC, who is a specialist in the subject and who shares great knowledge and practices to improve our common well-being. According to the Xochilt, it is not about seeing this issue as a self-punishment, but focusing on how we are going to love ourselves today, how we mix eating with a positive emotion. In fact, the psychologist explains very interesting things such as, for example, the relationship that exists between illness and emotional disorders and how we can give ourselves intelligent love with food. Xochitl Carrasquedo, LLPC is also a Mexican clinical psychologist at the Regional University of Southeast in Oaxaca, Mexico, has been invited. In the United States, she has a Master’s degree in Counseling Psychology with an emphasis in Family and Couples Psychotherapy at Wayne State University, Michigan. She uses a holistic approach in which the person is observed, evaluated and advised from three dimensions: mind, body, and emotions. What will you learn in this episode? 1-When is the eating emotional? 2- What are the most serious consequences of emotional eating? 4- Why do we look for a moment to eat and “feel good”?